This recipe brings back so many memories. My Spanish grandmother used to serve them as a starter for Christmas lunch. This was replacing the traditional “escargots”. 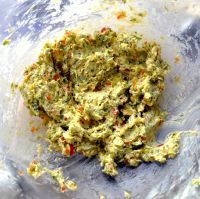 In this recipe I have used coriander and chilli, but you can easily substitute them for parsley and French shallots. Mix the butter with the garlic, shallot, chilli, coriander, lemon juice and zest in a bowl and season to taste with the salt and pepper. Put the mussels into a large pan, cover and place over a high heat for 3-4 minutes, shaking the pan every now and then until the mussels have opened. Let the mussels sit for a few minutes until they are cool enough to handle. 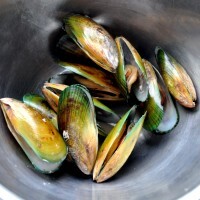 Then drain the mussels through a colander, break off and discard the empty half-shells leaving the mussel meat in the other half before laying them out on a tray. 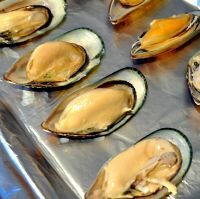 For ease of eating, you can use a sharp knife to cut the abductor mussel that holds the meat to the shell. 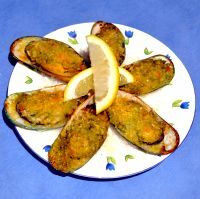 This is optional but makes eating the mussel a lot easier after it is grilled. 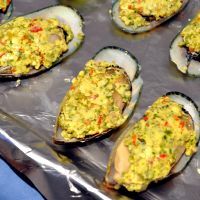 Coat each mussel with the coriander and chilli butter. grilling the mussels for 2-3 minutes until they are crisp and golden brown. 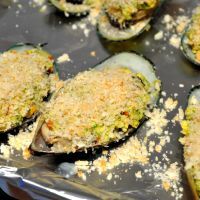 Note: To help with the final presentation of the dish, you can put down a layer of rock salt and lay the mussels on top of it. This will keep them stable on the plate and prevent the shells from sliding around or tipping over.